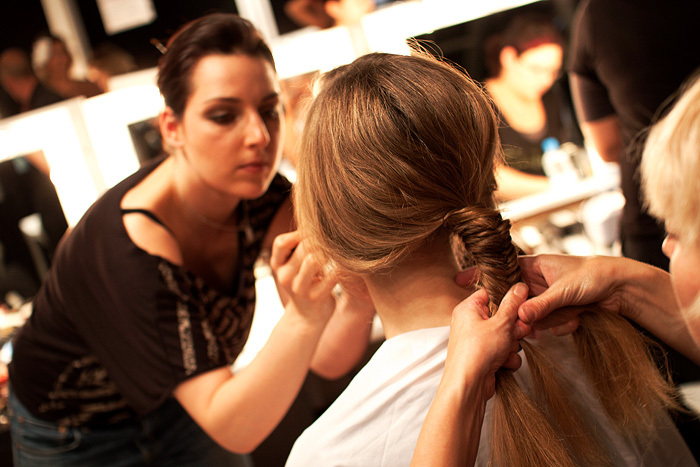 Yesterday, I talked about the behind-the-scenes atmosphere at Jean-Pierre Braganza’s SS/12 show which took place last Friday at the BFC Show Space in Somerset House. Today, I want to focus on the look that makeup artist Alex Byrne created with Benefit Cosmetics to complement the designer’s graphical, almost art-deco tailoring. She wanted a strong look that remained feminine, working with and not against the strength of Braganza’s designs. 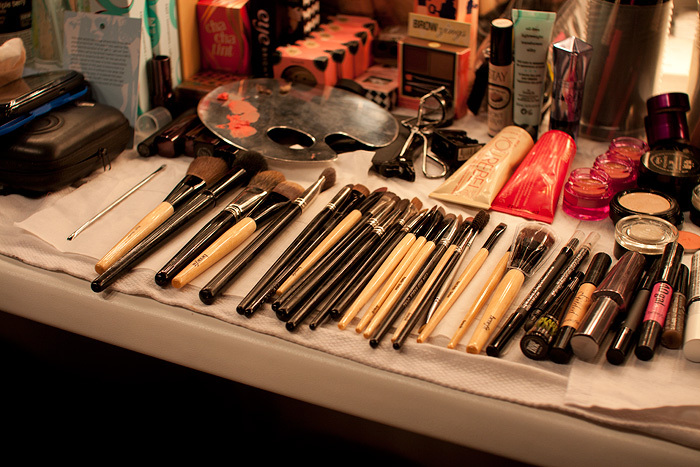 are those new brushes I spy? Alex in deep concentration (where did I put that brush?!) 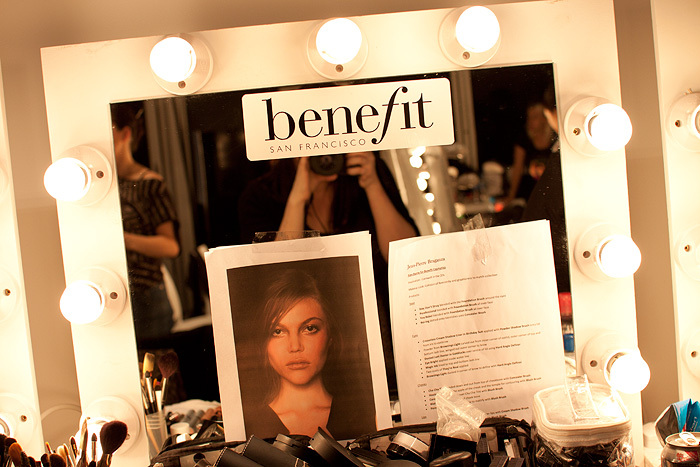 Faces were kept light with Benefit’s Boi-ing Concealer where needed and a light layer of You Rebel Tinted Moisturiser mixed with Porefessional. Eyes were kept neutral with Benefit Creaseless Cream in Birthday Suit, Browzings in Light and many, many coats of They’re Real mascara as an alternative to false lashes. …and blended out with Coralista Powder Blush, the picture-perfect slices of cheek colour mimic the graphical edges in Braganza’s designs. …and a sneak peek of the new product in question. Full Finish Lipstick in Mod Squad completes the look. 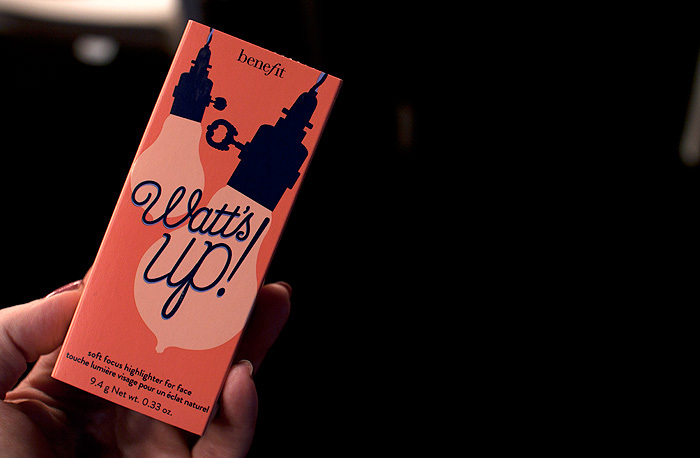 Thanks to Benefit Cosmetics for letting me have a sneak peek to see what goes on behind the flashbulbs at London Fashion Week! Gorgeous! I LOVE the cheeks. However I had to leave a comment to tell you how much I enjoyed this post… one word – amazing! So interesting and definitely a different type of post than lots of others! Better than Vogue could of done! My eyes have gone greeeeeennnnn!